Our aviation selection and assessment suite include a range of tests run through our ADAPT system covering three core areas: skills and aptitudes, attitude and behavior, and knowledge tests. FAST - Future Aptitude Screening Tool, measures the candidate's ability to perform multiple overlapping tasks while also demonstrating learning. Cognitive, problem solving and decision-making. Contextual flying tests (fixed wing or rotary wing) for control and co-ordination in 3D environments. Our Advanced Personality Questionnaire, including specific aviation constructs can be tailored to report on candidate suitability including national and organizational cultural fit. Crew resource management, conflict management style and threat error management. Motivation, pressure management and coping strategies. Symbiotics staff will work with you to identify the key traits of your role and company culture, to identify the right tests and assessments to identify the ideal candidate, providing an output report that allows you to see the strengths and weaknesses of each candidate and make an informed decision of who to employ. Click here to see our recommended test portfolio for the aviation industry. Once the tests have been completed the result is a single integrated report that can be analysed immediately. The report includes a detailed breakdown of several areas: candidate personality, physical and cognitive performance, situational awareness and learning, telemetry data, teamwork, attitude and efficacy. It is summarised by categorising the candidate into a personality profile and colour coded for ease of interpretation. The top performers can be easily identified and training requirements established and scheduled. We undertake pilot assessment days on behalf of CAE and airlines around the world. The day consists of a selection of online tests, group exercises and a one to one interview. This can be hosted at a suitable location of your choice or from our Worcester office in the UK. FAST is one of Symbiotics' best-known online aviation products used widely as part of our ab-initio training selection and can be completed either prior to the event or at the assessment day as a pre-screening process. The FAST assessment is a 15 minute test designed to test physical and cognitive skills in a multi-tasking environment. FAST acts as an initial indicator of an individual's ability or likelihood to graduate from the training pipeline and is an ideal cost effective filter for selecting appropriate candidates. Click here to find out more about FAST and our other assessments. Our aviation assessment day puts a candidate through a variety of tasks designed to identify and examine traits and skills that relate specifically to the role in question, be this ab-initio or command upgrade. The day comprises of aspects including a research task and presentation, structured interview, cognitive testing and flight assessments. All of these are pulled into one output report for the client, providing guidance on a candidate's likelihood to succeed and identifying area for development through an easy-to-understand colour coding system. EASA regulations call for personality questionnaires as part of the selection and recruitment process for airlines. Whilst this is welcomed, a personality questionnaire only assesses aspects of a person that are constant to an individual; it is not looking at mental well-being that is a state and subject to change over time. For this reason, Symbiotics offers MindQ™ and MindFull, both online mental wellbeing assessment to help identify those at risk of mental health conditions. The results from MindQ™ can be tracked over time using MindFull, to identify any reduction in the individual’s mental wellbeing before it becomes a risk. 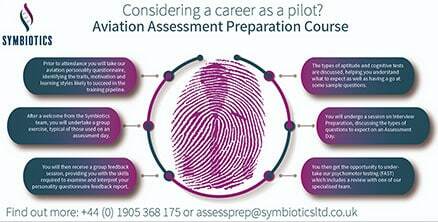 Let Symbiotics help you to exceed the criteria within the IATA Guidance Material & Best Practice for Pilot Aptitude Testing and stay ahead of the latest EASA regulations on mental fitness of aircrew by monitoring pilot mental health and wellbeing and allow early support and preventative to be taken to ensure the wellbeing of your staff. Click here to find out more about our mental wellbeing assessments, supporting aircrew mental health. Symbiotics work with airlines and aviation training schools globally delivering pre-screening and selection assessment solutions, as such we are highly experienced and well placed to advise on how to prepare if you are considering entering the pilot training pipeline, changing employer, going for promotion or changing career path. Our first set of courses are running at Buckinghamshire New University on 23rd, 24th and 25th of April. Book now to secure your place! 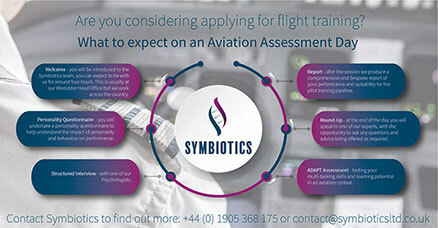 Symbiotics want to give you the best chance of success in your aviation career. In order to help identify your strengths and weaknesses, and any other factors which may have an impact on your ability to succeed within the training pipeline, we offer aviation assessment preparation days. These provide an industry recognised report giving potential flight training academies or employers an insight into aspects such as your trainability, learning styles, skill potential, personality and motivation. They can also identify areas for a candidate to develop on to help increase their chances of success. Our aviation assessment days are hosted at venues nationwide throughout the UK. The day includes a personality questionnaire, FAST online (our unique multi-tasking assessment tool), structured interview preparation guidance, group task and a round up session with one of our experts who will give you feedback on your performance and guidance on areas to look to develop. You will leave with a comprehensive and bespoke report of your performance and suitability for the pilot training pipeline. Please note: Our assessment days are vendor neutral and there is no age limit on our assessment days. However, the levels of tests are aimed at age 16 & above and therefore results for younger candidates may not be an entirely accurate representation of suitability. Symbiotics provide pre-assessment and selection services for the aviation industry. If you are attending an assessment day, either through us or one of our partners, have a read of what to expect here. If you want to practice some of our aviation tests, click here to be taken through to the aviation assessment package and buy now. 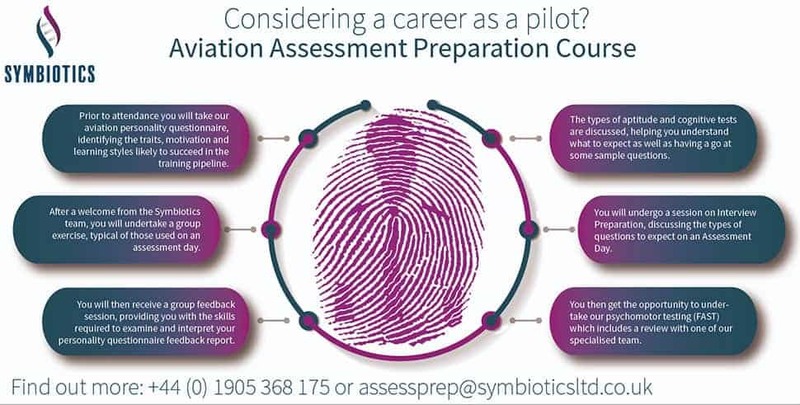 FAST is one of Symbiotics' best-known online aviation products used widely as part of our ab-initio training selection and can be completed either online prior to the event or at the assessment day as a pre-screening process. Our FAST assessment is an online 15 minute test designed to test physical and cognitive skills in a multi-tasking environment. FAST acts as an initial indicator of an individual's ability or likelihood to graduate from the training pipeline. Buy our FAST test here and see our supporting aviation test package.